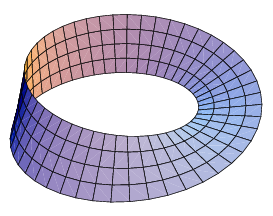 A Möbius strip is a one-sided shape. It is formed by taking a thin strip of material, twisting a section 180 degrees, and making the two ends touch. Despite being one sided, the object does, in fact, still exist in three dimensions. If one is cut down the middle, the result is a strip with two twists; if this strip is cut down the middle, the result is two interlinked bands. The shape was independently discovered by German mathematicians August Ferdinand Möbius and Johann Benedict Listing. Topologically, it is one of the two possible quotients of a rectangle; the other is a torus. This page was last modified on 12 July 2016, at 09:16.